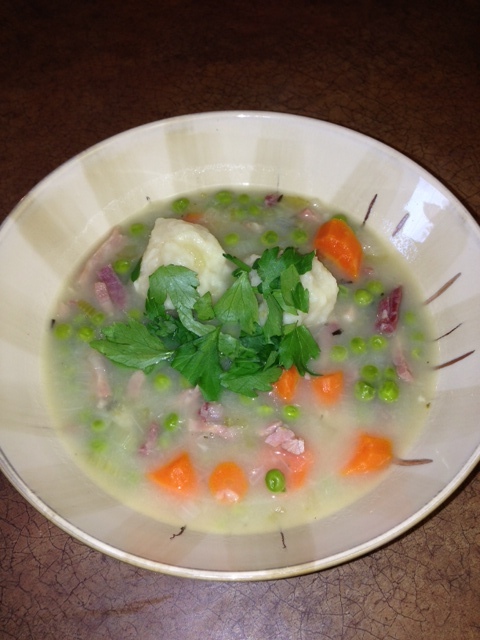 Humble Pea & Ham Soup (with Dumplings) | So Hungary! I love leftovers. However, there is one leftover in particular which haunts me and my elementary school lunches…ham. My problem with ham is that it seems to last forever, and this kid can only eat so many ham sandwiches. To the point… what do I like about this recipe? First of all, it is a great way to use up all of your leftover ham after a big meal, but most importantly, it is delicious. The ham adds a great salty and smoky taste, and the dumplings make it hearty and thick. This soup is great for a cold winter day and definitely won’t last the week (even for me)! Put a deep pot on medium heat with a few lugs of olive oil. Cut the ham into long slices roughly 3/4 inch thick, and discard any fat or skin (you can cut the ham into bite size pieces to save time later), and place them in the bottom of the pot for a few minutes. Finely chop the onions and celery, roughly chop the carrots, and add them all to the pan with the bay leaves. Cook until the onions turn translucent. Cover with 12 cups of water and add a good pinch of pepper. Bring the pot to a boil, then simmer for 1 1/2 hours with the lid on, skimming away any froth from the top of the soup as it cooks. Meanwhile, put the flour for the dumplings into a bowl with the baking powder and a pinch of salt. Grate in your chilled butter using a cheese grater and add a few good grates of nutmeg. Add about 1/4 cup of cold water and squish this all together to form a dough (it should be firm and malleable). Divide the dough into 12 equal pieces and roll them into balls. Place the dumplings on a well floured cookie sheet and cover them with plastic wrap until you are ready to add them to the soup. Once the soup has been simmering for 1 1/2 hours, taste the broth and season to taste. If you haven’t already cut the ham into bite size pieces, remove the meat and then shred it back into the soup. Bring the soup back to a boil, add the peas and rosemary. Grate in the zest of the lemon. Now, add the dumplings and turn the heat down to medium and leave the soup to simmer for 15 to 20 minutes, until the dumplings have plumped up nicely. Serve the soup immediately with the reserved celery leaves for garnish. As this soup sits, it begins to get thicker, and the dumplings get a little bit tougher, but it is just as tasty. I hope you give this recipe a try next time you are stuck with lots of left over ham.